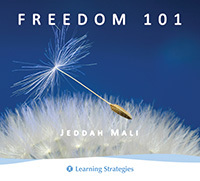 Jeddah Mali presented Freedom 101 as a 9-session teleseminar series to help you understand the foundation of your life and mold it into what you want. The recordings are now available as digital set in your online Library or on CDs we can ship to your home. Freedom 101 goes hand-in-hand with Jeddah's Seeds of Enlightenment audio course, but you do not need Seeds of Enlightenment to get tremendous benefit and satisfaction. Freedom 101 is not the same as the Seeds of Enlightenment program. The audio course has almost two hours of instruction and five hours of meditations. Freedom 101 has almost 14 hours of instruction and conversation with various mini-meditations contained within each session. You will find a description of each session below. You have heard that "everything is energy," but what does it really mean and why is it important? without understanding the properties of clay. No tailor could make a custom suit without understanding the properties of fabric. No woodcarver a masterpiece without understanding the properties of wood. So it follows that if you want to be a master of creating your own life, you need to understand the composition of life, which is energy. When you understand this building block, your understanding of everything changes for the better. You look at yourself, your life, and everyone and everything in your life in a completely new light. You realize your potential is waiting for you, not out of reach—it is not something you have to achieve—it is right there. Jeddah will talk about the scientific, religious, and philosophical components that all point to the same understanding, that everything is energy. You will explore how energy is malleable and suggestible, and how you can influence it, work with it, and form it into what you want to create and experience in real life. This means, if you don't like what you have created so far in your life, you can change it. So many teachers talk of being in the present moment. But what does that mean? Jeddah says, "It is the doorway into the secrets of the universe. It is your window of opportunity to orchestrate your life." On the everyday level, when you are truly present at work, you do better work. When you are present with a friend, everything clicks. When you are present with health choices, you feel better. But if it holds the secrets of the universe, there is obviously much more. You see, when you step into the present moment and out of regrets about the past and worries about the future, you rescue energy you have been frittering away. You are back in the driver's seat, all fueled up, and able to plot the course you choose. When you are aching about the past or consumed by the future, working with energy feels like pushing a boulder up a hill. If you want to have any hope of changing something, you have to be in the present moment. Being in the present moment allows for change. It is where your true power lies. Some people say this is what being "spiritual" is all about. Jeddah says this is what living your potential is all about. The simple act of making an intention is extraordinarily powerful, and it can turn your life around. Most people do not understand they are intending all of the time. They don't realize that persistent thoughts are intentions. You may say "I wasn't intending on having my husband leave me," but if you've worried about him leaving and had persistent thoughts about it, you are intending it. Intentions are not only the things you want or things you consciously or purposefully move toward. The energy is reading the underlying intention, not the overt intention. Jeddah will help you understand the difference, so you stop manifesting things you don't want. Intention works better when you understand the nature of energy, because then it is easier for you to see what kind of intention is compatible with the energy. That compatibility is crucial. Your inborn feedback mechanism (yes, you have one) is also important. Feedback is always provided to you. It is like a personal angel tapping you on the shoulder, pointing things out. Whether or not you are listening, it is there. When you use it as an instant course correction tool, it can have an incredible impact for you on your life. Jeddah says the one-two punch of intention and feedback (in the present moment) is perhaps the most important skill set you can learn if you want to live a happy and rewarding life. Everything doesn't come up roses just because a person is spiritually aware, or even enlightened. Your emotions and intellect have a way of interjecting themselves on a daily basis. It is part of being human. Sometimes they support you, sometimes they mess you up, and sometimes they give you interesting twists and turns to navigate. Whatever the case, if you feel you cannot change what's happening in your life, you might as well give up. Luckily you can change. You hold all possibility. Jeddah will help you understand how to deal with limitation and dissolve the resistance so more roses show up in your life, day after day, season after season. Most people wait for change to come externally. "They think it is some strange, universal lottery that governs it all. It is not like that," says Jeddah. "We have far, far more control over our internal state." We don't have much control over what happens externally, which is why it is such a poor place to put your expectations. You cannot always make things happen on the outside, but you can always make things happen on the inside. Jeddah says, "It is where we take responsibility. And we need to do it, otherwise we sit around complaining that our life doesn't look the way we want it. We don't realize that by waiting for things to happen on the outside, we are giving away the power for things to change. "You can actually make a significant difference. People always imagine that when they change something on the outside, they will be happy—but that doesn't always work. If you change on the inside, you can be happy with the identical set of circumstances you were just bemoaning. "It is an absolutely vital skill, otherwise you stay in the same state and you don't move forward." So go to where the opportunities are. If you want food, don't go to the hardware store and wish for roast beef. Go to the grocery store. Work with what is. Make changes on the inside. We all come with Energy Centers. Also known as Chakras. Windows to your soul. Windows into your energetic being. Peering into every aspect of yourself through these centers opens your eyes to what is off your conscious radar. It is out of sight of the average person. Through these windows you can access your gifts that express the original qualities of your being. Your energy centers are also mirrors to your day-to-day life as a functioning (or not-so-functioning) human being. Would you like to change circumstances in your life? Tune your energy centers. Are you attracting the wrong people into your life? Are you in emotional overwhelm? Do you have nightmares? Do you have problems at work? Do you battle with your partner? Tune your energy centers. Because it is easy to feel the energy centers and its energy, you automatically start to operate, or vibrate, at that frequency. You start to realize you are far more expansive, light-filled, and harmonious than you've given yourself credit. Most people firmly identify with their humanness and see spirituality and enlightenment as over there, as some state you arrive at. Jeddah says, "That's nonsense. It is with you all of the time. People don't really believe it until they explore the energy centers, because the centers help introduce you step-by-step to the notion that it is there all of the time, and that you can draw on it whenever you want." You also have Energy Bodies, which relate to your Energy Centers. They connect you to every other aspect of existence, of the Universe. They literally connect to every other human being on the planet. Think Oneness. When looking at your day-to-day life, strengths in your energy bodies show up as strengths in your life just as weaknesses in your energy bodies show up as weaknesses in your life. All of our patterns are stored in the energy bodies. Patterns of feeling stuck, low, thwarted, aggressive, hurt—anything you are feeling repeatedly. The easiest way to change these patterns is through the energy bodies. Of course, not all patterns need to be changed, because our energy bodies store harmonious patterns, too. These are like presents that in many people go unopened. Creating optimum flow in the energy bodies, creates optimum flow in your life. It directly impacts what happens today and tomorrow. "Trust" turns the key in the lock. Everything happens with trust. We're not talking about trust in other people, but trust in the design of the universe. When trundling down the road, you trust in the car. You cannot say, "I'll trust that the pistons will fire, but I cannot trust that the wheels will roll." It's all or nothing. You must trust in the design of the universe just as you trust in the design of a car. That is the only way you can experience an enduring and expanded version of yourself. "Surrender" is misunderstood, and people imagine you have to give up everything. In actuality, we're talking about surrendering things you don't want. If you don't like it, give it up! Otherwise, it's like smoking and complaining your lungs are full of gunk. You surrender that which you no longer need and that which no longer works for you. When you surrender—"I am giving up things that are not working any more. I'm going to try a new and better way"—you create room for all the wonderful things you have been dreaming about. We have a vague notion there is a better life for other people, and that it has something to do with education, money, looks, right family, or the goddess of fortune. This notion sets you up for failure, because none of that is true. None of it generates or maintains happiness. Jeddah says, "It is literally the place you are looking from that determines what you see." Can you imagine looking out at the world from the place of a light-filled being rather than your physical, emotional, and mental patterns? But… your true nature is harmony, expansion, love, and peace. To some that may come across as a spiritual cliché, but as you're learning, it is the truth. And, there are no exceptions. You see it when you look beyond your emotions, your intellect, and everything that defines you in your day-to-day life. You can have all these qualities expressed in your life and still be an officer, politician, mechanic, secretary, or manager in modern society. You don't have to be a monk or an artist. AND… There is nothing improvised about life. There is a design. It is seeking to bring out the best possible outcomes all of the time despite how the world looks or how you feel. Jeddah says, "Problems come from inadvertent misuse, and not from a flaw in the design." It's no one's fault when life doesn't work for them. We didn't come with a manual. We have to learn the stuff as we go along. And as we do, we can create a life that is richly rewarding, satisfying, and peaceful.